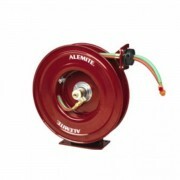 Alemite Severe Duty Reels are designed to deliver maximum strength and durability in harsh working conditions. Tough jobs require tough equipment. The thicker, fully welded base plate provides solid stability for mobile applications, and weather resistant gaskets and O-rings protect internal components from corrosion.